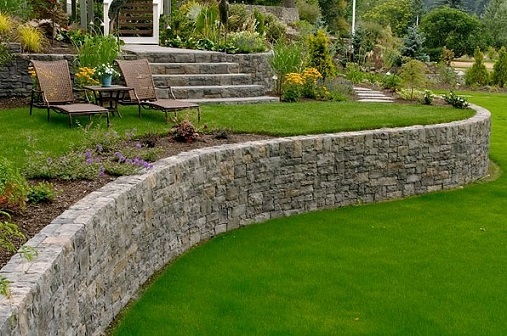 Retaining walls are a efficient and multipurpose element within your landscape design. They provide smooth ground on a slope, allowing you to plant a garden, or giving you place for some outdoor activities. A retaining wall gives you the power to lay mulch or plant a garden, helping to transform your yard into the landscape design of your dreams. When you need a team of experienced, trained, and professional retaining walls and hardscaping that take pride in their work, then contact Caligreen Landscaping. Over the years many different retaining wall materials have helped to alter the landscape in which we live. Common retaining wall products include railroad ties or treated timbers as well as wall stones, natural stones, bricks and concrete block. While wood is often an inexpensive and simple choice for a retaining wall, its short lifespan makes it a relatively poor choice. As the wood decomposes, so does your retaining wall and the integrity of your usable space. Stones, rocks or boulders can create beautiful retaining walls. So our professional install and maintain this kind of walls very efficiently.